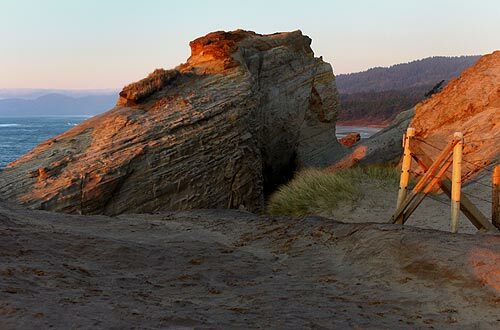 (Pacific City, Oregon) - Somewhere between the surface of the moon and some vaguely habitable world from any of the Stargate series, Cape Kiwanda's top area is one surreal mother-of-all Oregon coast freaky spots. This sandstone behemoth rises a few hundred feet up into the air with its ragged dune, looking like something out of one of the Mad Max films from the 80's. This sandy structure then gives way to the stony surroundings of the headland itself, and a host of intricate shapes and engaging viewpoints. All the while, the ocean rages just below it, knocking around its western points with its many curves and crevices, and then through its mysterious oceanic canyon, which is formed by two huge chunks of sandstone that were apparently part of one structure at one time in its long geologic past. 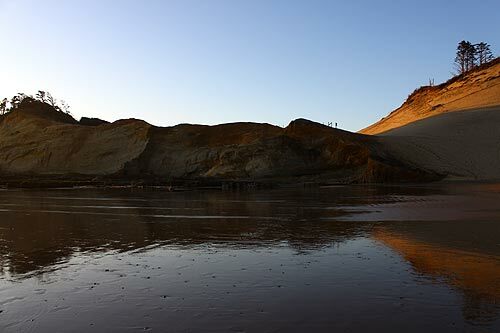 You start this wild journey by trekking up about 40 feet of seriously annoying, leg cramp-inducing sand on a steep rise. Coming down, however, is much easier, even quite gleeful and pleasurable, as you can bounce your way down the loose sand in a way that's not too dissimilar from astronauts hopping around the moon in a low-grav environment. You'll see plenty of amazing designs of nature, as this soft rock has been carved by ages and ages of wild waves and raging winds, slicing out smooth curves in surreal shapes and jagged outlines in other places that confound the imagination. Sometimes it's as if someone had given Dr. Suess a freehand in developing and designing a chunk of land. There's probably about a quarter mile of it, from south to north. Fencing keeps you from wandering off these cliffs into the broiling surf below. These edges rise and fall in strange, engaging shapes. Some are smooth in spots, often laced with lateral lines or small grooves, probably from all kinds of weathering. Some are jagged and knobby, as if Mother Nature only allowed weathering intermittently. In some spots, the rock has ruts running down it, presumably from rain water carving out a path. Other spots are puzzlingly smooth. You'll even find some spots with a wild pock-marked look, reminiscent of the moon. There's an enigmatic mini-bay of sorts here, and some other wild secrets lay beyond a forbidden chunk of the headland. 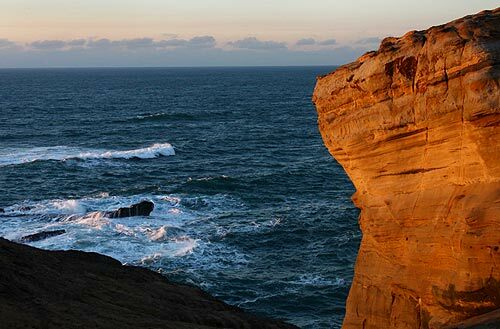 Several sections of Cape Kiwanda look straight out to sea, where you can soak in the panoramic view of this part of the Oregon coast and the blindingly beautiful sunsets that can light up this area's golden cliffs into fiery, memorable reds and oranges. At its northern end, a curious canyon erupts into sight. Obviously, something was connected here once. All of this was one headland. 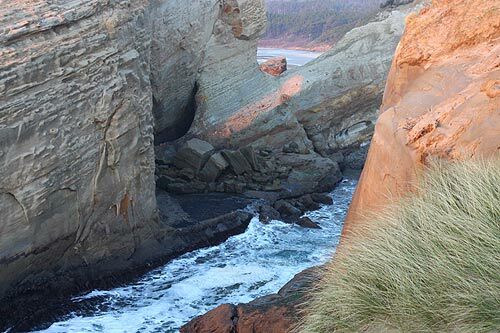 In fact, until February of 2011, there was still a small sky bridge of rock connecting the outer chunk to the greater portion of Cape Kiwanda. 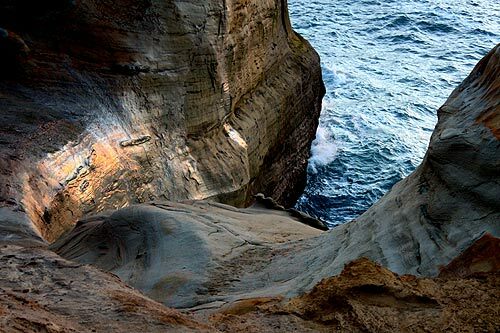 Still, however, this gigantic, angular section of sandstone sits a few dozen feet away from its parent headland, allowing the ocean to race in between and create all kinds of raucous, all the while eroding the area even more. 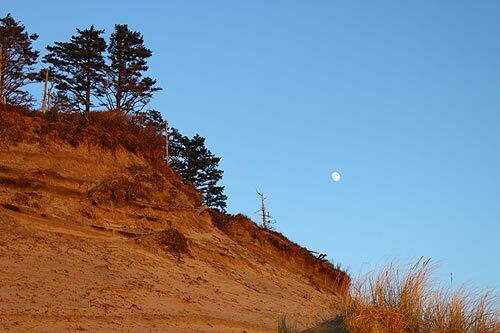 Pacific City is about a half hour drive from Lincoln City, and about an hour or slightly more from north Oregon coast hotspots like Cannon Beach or Seaside.